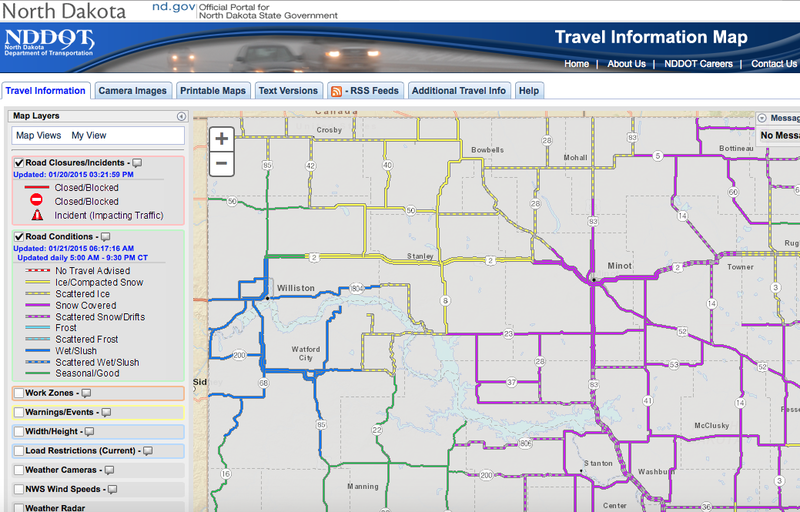 One of the only known 6:23AM screen shots from the NDDOT road conditions website on January 21, 2015. It’s about 6:20AM (at least as I sit down to type), and the snow is letting up. I’m sitting in a hotel room in Minot, Ward County, North Dakota, on the eastern edge of the Bakken. I have a short field-research trip to the west, but I’m temporarily yielding to the ND Department of Transportation’s road conditions map. Which appears like this, at left. I’m updating this blog post with a couple items on my brain. The first is another public history sighting of Reverend Aaron McGaffey Beede, PhD. Beede figures seriously in the history of North Dakota, and only a handful of scholars have sifted through his papers. Last week, during a lunch meeting in the Peacock Alley, in historic downtown Bismarck, I sat at a table and looked over the picture to my left. In addition to offering delicious food (I ordered the half-prime rib lunch special with chips), the owners of the historic Peacock Alley have reproduced numerous local historical photos to hang on the walls. This was one of them. There is a gentleman addressing the legislature, with cigar in left hand. I accidentally cut out of the photo the ash tray at the foot of the podium. Believe me: it was there. Those were different times. 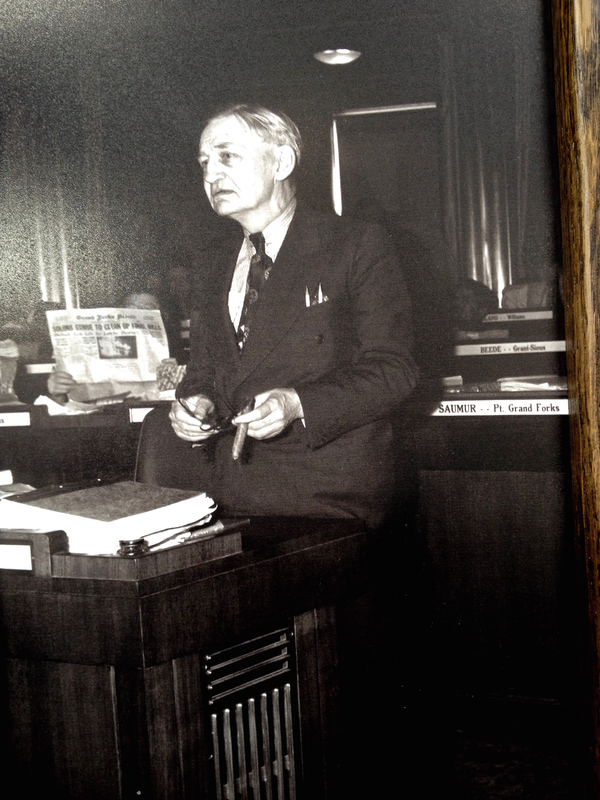 Note the ND legislator from the ’20s or ’30s, with cigar in left hand, and the nameplates on the desks behind him. “Beede, Grand Sioux” is behind him. Behind that, behind the name Saumur of Grand Forks, is “Beede, Grand Sioux” agency or county. It was great to see the photo, and that is about all I have on it right now. I’ll do some more tracking on this. Beede figures into a chapter of my ongoing dissertation which, roughly, figures into how and why the US-Dakota Wars were remembered on the northern Great Plains. Beede was formative in shaping and pushing that memory in one direction, arguing just after the turn of the 19th century that Natives need to be listened to and allowed to tell their version of history. It was serious push-back against the Social Darwinian and Manifest Destiny crowd (some of which is still around today). How do we understand the current crop of 3D modeling technologies in the context of the history of archaeological imaging? Are the most optimistic readings of this technology a mere echo of earlier enthusiasm for photography in an archaeological context or is this somehow qualitatively different? Is there an emerging consensus on best practices of 3D imaging of archaeological sites? What are the current limits to this kind of technology and how does this influence the way in which data is collected in the field? How do we understand archival considerations for 3D models and their dependent data? For example, what happens when we begin to prepare archaeological illustrations from 3D models collected in the field and processed using proprietary software? How do we manage the web of interrelated data so that future archaeologists can understand our decision making? What is the future of 3D modeling in archaeology? At present, the 3D image is useful for illustrating artifacts and — in some cases — presenting archaeological and architectural relationships, but it has yet to prove itself as an essential basis for analysis or as a viable medium for communicating robust archaeological description. Will 3D visualization become more than just another method for providing illustrations for archaeological arguments? Without going further into this (it’s about 6:50AM, and I need to move forward with the morning), you can read the entire collection of academically produced and academically edited and academically published essays, for free, at this link here. Thanks Bill and Brandon and Susan for compiling this. I know there will be many more.